A Seattle teacher strike would not only stiff thousands of kids, it would hurt broader efforts to improve education funding. WASHINGTON state is in the midst of an education crisis that requires extraordinary cooperation and political compromises to resolve. The last thing that’s needed is for teachers in Seattle, the state’s largest school district, to march out on strike because they don’t think their demands are being taken seriously. Under state Supreme Court sanctions, lawmakers and the governor are now working on a sweeping overhaul of education funding. The goal is to have the state fully fund basic education instead of relying on a crazy quilt of local levies that vary district by district. Education dominated the last legislative session, which provided an additional $1.3 billion for education; a bipartisan group of senators drafted a good framework for levy reform. Education will dominate the 2016 session as well — leaders in both parties agree they need to provide another $3.5 billion for the reforms. What message will Seattle teachers send by striking, besides stiff-arming more than 50,000 kids and their families? They were looking forward to school starting Wednesday. Contract particulars will be forgotten. 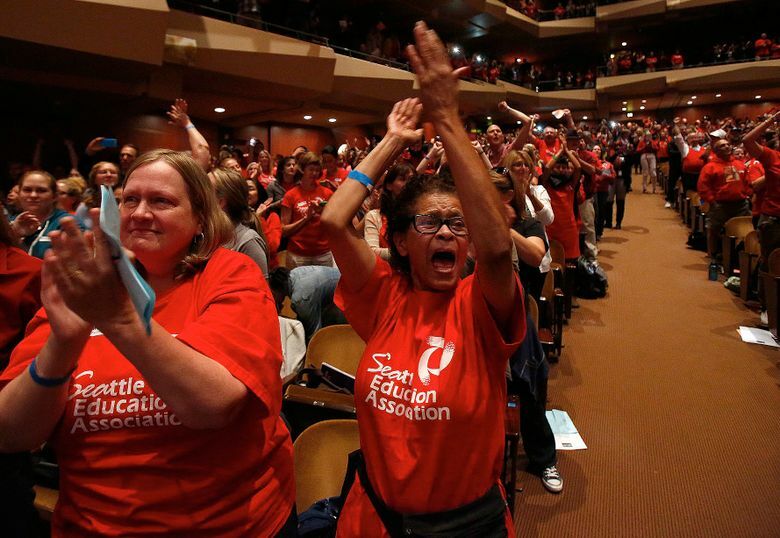 What could be remembered in Olympia is that Seattle teachers walked out demanding raises of 18 percent over three years to take home as much as possible of additional funding the district received. That is in addition to the Legislature’s increase of 3 percent over two years and a one-time 1.8 percent increase. This will be top of mind for lawmakers writing the new education-funding plan that decides who gets what and how. Teachers’ striking for such high increases also gives ammunition to those who believe teachers are already well compensated. It sends the message that whatever additional school funding is provided will simply be siphoned off by unions for wages. The Seattle School District has provided a generous offer of an 8.2 percent raise over three years — on top of the state-provided increase. A raise is reasonable given district plans to extend the school day and Seattle’s increasing cost of living. Nevertheless, Seattle teachers voted Thursday to strike if the union and district don’t reach agreement. The teachers are demanding too much — so much that they will have a negative effect on broader efforts to reform the state education system. They’re at risk of becoming a symbol of excess for those who oppose more school spending. Also troubling is that the district called for mediation last Tuesday but the union declined to participate until Friday (after its Thursday strike vote), according to an update from Seattle Public Schools Superintendent Larry Nyland. That wasted precious days that could have kept schools opening on time. Don’t forget that teacher strikes are illegal, according to the state Attorney General’s Office. On Friday morning, a Franklin County judge ordered Pasco teachers, on strike since Tuesday, back to class. Disruptive, last-minute strikes happening across the state also make clear that teacher contracts must be negotiated at the state level, not locally, once the state fully assumes funding of basic education. Seattle teachers should look at the bigger picture, continue working with the mediator and get their contract done on time.